Purpose: In 2015, our group in the Department of Anesthesiology, Perioperative Medicine and Pain Management at the University of Miami began a retrospective review of our operative procedures at Jackson Memorial Hospital in the context of the non-PQRS measures concerning postoperative nausea and vomiting (PONV) . The goal of this research is to better understand our current practice to improve measure compliance and provide better care for our patients. Background: One of the most common and most distracting effects of procedural anesthesia is PONV. PONV can cause discomfort and pain which lead to poor patient experiences and, in some cases, to have serious consequences from vomiting such as aspiration of gastric content or esophageal rupture . As many as 20-30% of patients experience PONV if no prophylaxis is administered . This number can increase to 80% in patients with multiple risk factors including history of PONV, smoking, female gender, and opioid use . Thus, a clear need to provide PONV prophylaxis arises in the perioperative setting. Methodology: For our review, we analyzed perioperative data from our PICIS electronic anesthesia record system. The data set ranged from January 1, 2010 to December 31, 2015 and originally included 68,276 procedures performed in the at Jackson Memorial Hospital; of those, 38 cases (0.05%) were removed from due to missing data elements. Results: The variables we examined included type of anesthesia received, PONV risk factors, and pharmacologic prophylaxis administered. Of the 59,066 adult cases (Age>17), 47,921 (81%) received general anesthetic. Within this group, 46,650 received an inhalational agent as part of the general anesthesia technique. We first examined the risk factors of that adult subset who received an inhalational agent as part of general anesthesia [Table #1]. We also examined the three pharmacologic agents most often used in our practice within that same population [Table #2]. 49.4% our population over the past 5 years has received at least 1 prophylactic agent (23,042 cases), 8.8% (4,125 cases) of which received multimodal treatment. When considering risk factors, however, only 3.4% of patients (1,616 cases) were identified as positive for at least 3 risk factors. 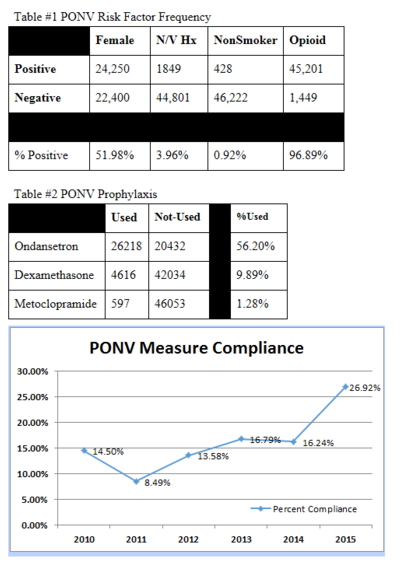 Of these, the average multimodal PONV prophylaxis usage was 14.98% (242 cases). Looking at the data over time, we see in the PONV Measure Compliance graph a trend toward increased use of multimodal prophylaxis in this high risk population. Discussion/Comment: Several conclusions can be made from our review. Regarding non-smoker risk factor in particular, we found very few patients to be “true” non-smokers however. As we get better at defining, identifying and documenting these risk factors our at risk population changes. Regarding the prophylactic agent usage, our data shows opportunity to improve the usage of multimodal prophylaxis in the high risk patients likely by building on our solid usage of ondansetron with another agent. Our data does show increasing usage of multimodal prophylaxis over time and that we have an opportunity to build on or focus that change to better meet the needs of our high risk patients.